The new dressed corner stone from the inner face of the outer wall of the south-west corner of Structure Ten. Antonia’s interview with Professor Peter Eeckhout. Those of you with access to even the most incompetent weather forecast will know that, here at the Ness, we have been suffering, yet again, from unremittingly foul weather. Yesterday was bad enough, with rain which began in the early morning and carried on throughout the day until, insomniacs tell us, about 3am this morning. Come dawn — or what passes for it when the world is shrouded in billowing mist and drizzling rain — it was still miserable and reminiscent of a November morning. The site matched the weather exactly. It was grey, damp and exceedingly wet in places. But that’s enough of the bad news. Flitting through the mist were grey, wraith-like creatures, who eventually resolved themselves into the Franco-German television (ARTE) crew with presenter, Professor Peter Eeckhout. 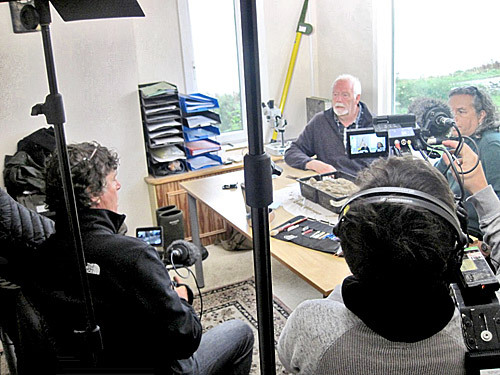 Our very own Roy Towers discusses the wonders of Grooved Ware pottery on camera. 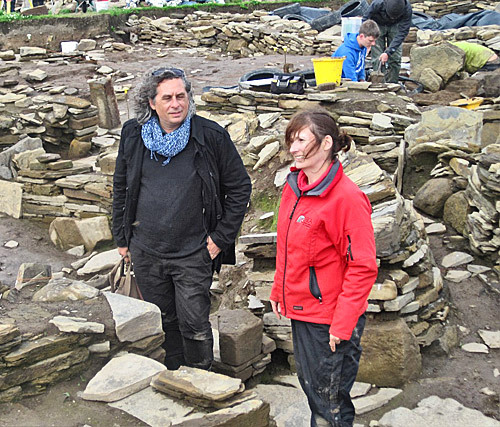 They are spending the week filming the Ness for a programme on amazing archaeological sites around the world. The other good news, which metaphorically split the clouds and let the sunshine pour through, was a plethora of finds from around the site. 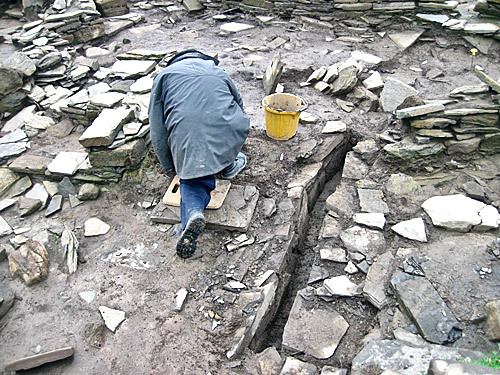 Principal among them was, yet again, Claire and Jan, working in the robber backfill in the south-west corner of Structure Ten, and this time uncovering yet another magnificent piece of decorated stone. It is a large, finely dressed, pecked slab of yellow, fine-grained sandstone, with the best decoration reserved for a handsome curving edge. As Mark said, without the slightest trace of a blush, it was “dressed to impress”. It is around 75-80 cm long and, most curiously, was placed in the wall of Structure Ten in a way which would make it invisible. 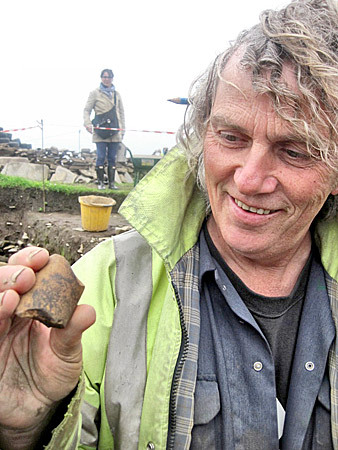 A whalebone macehead fragment discovered by Mark. This is a recurring theme at the Ness, where decoration is often rendered invisible by its location. We have no definite answers for that question, but it is possible that such stones are being re-used and are maybe required to be hidden for this secondary purpose, while no doubt retaining their power and meaning. To add to the excitement Mark, when examining the dressed stone, discovered placed on top of it what looks very like a finely made whalebone macehead. These are incredibly rare and the only other example we know of excavated recently was the one discovered up against a pier in Structure Eight in August 2010. To have found two of them is ridiculously fortunate. 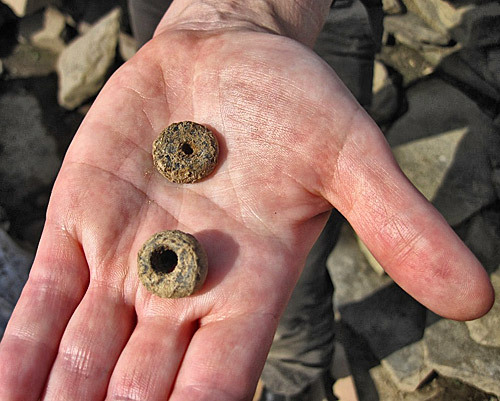 Not far away, and still in Structure Ten, Jay has uncovered two attractive stone beads. They were tucked away in the north-east buttress and lying side by side in exactly the same context as the famous carved stone ball, which was uncovered on August 7, 2013. The beads may be made from cannel coal — or some similar shaley-type of stone — and are a nice addition to the relatively few beads found on site. Ray’s new drain in the north end of Structure One. The third discovery is one we mentioned briefly last Wednesday, but which is now visible in all its glory. In the Phase One, general area of Structure One — although probably relating to Phase Four — Ray uncovered a nice drain next to the north entrance. It feeds into a drain visible in the sondage to the west of Structure One and, at first, was thought to be possibly the recapping of an earlier drain. Fully excavated now, it is revealed as one of the most handsome drains we have seen — are we really rhapsodising about drains? Yes! It is wide, deep and most impressive and, in uncovering it, Ray, who excavated many of the roof tiles on site, has gone from the heights to the depths. 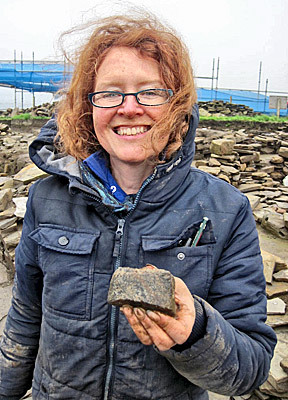 And finally, the last handsome find was by Jo Bourne, who discovered macehead fragment in the south end of Structure Eight, to add to the growing list of “bling” (technical archaeological term!) from this building. Our last piece of news for today is warmest congratulations to our new Orkney Islands councillor, Rachael King. We say “we” because the Ness is in the West Mainland of Orkney and that is the constituency which Rachael now represents. She is, of course, vital to the site as being the wife of site director Nick who, we suspect, may see a little less of her in the future. She will, we are sure, let him out to play for the excavation next year. Hello from Stenness School, on their annual pilgrimage back to the Ness in the first week back after the summer holidays. Hi, it’s Jay from NZ again — yup, for the third time. But it’s third time lucky, and I sure have been lucky. As you will have read above, yesterday I found two slatey beads in Structure Ten. Having moved, last week, from the exterior into the kitty-corner interior, I am working on a packing layer that wedged in the later-added piers. This is the fabulously famous layer that securely cradled the stone ball found two years ago (oh boy!). Starting last Tuesday, I have cleaned, photographed, planned and sampled this context and am now removing the rest as bulk-samples by 50cm squares. That means for each 50cm2 across the surface, the soil goes into a separate bucket. This becomes kinda confusing in that, although the layer is only about 1.5m2, its falls into 13 separate 50cm2 grid squares (eeek!). So I have been nervous enough about getting all the bits and pieces sampled correctly as it is. Jay’s two beads, from under the north-east buttress of Structure Ten. What I didn’t realise was that, thinking of my behaviour, I thought Neolithic folk would have placed significant items close together. Thus, figuring as long as I was extra cautious near the stone ball area, this layer of densely packed, impossible-to-get-through clay and grit was just pleasantly full of the delightful, colourful stone chips from shaping both local and foreign stone. So, I have to admit that I think my heart actual stopped dead there for a moment when I pulled back a piece of clay and was staring at a perfect donut ring that looked just like a rusted metal washer. And I have to further admit that the idea of a rusted metal washer horrified my mind so badly it just shut down with an absolute: No Possible Way. So it was with some relief when my brain processed it as “bead” and yet also anguish that it had laminated in half (thus explaining why the slatey material appeared rusted). Thanks to the gods (and the person who left them), up against this laminated one was a slightly smaller but chunkier complete bead (phee-eew!). So now I feel honoured, petrified, FINE (freaked-out, insecure, nervous, and emotional), thrilled and excited. 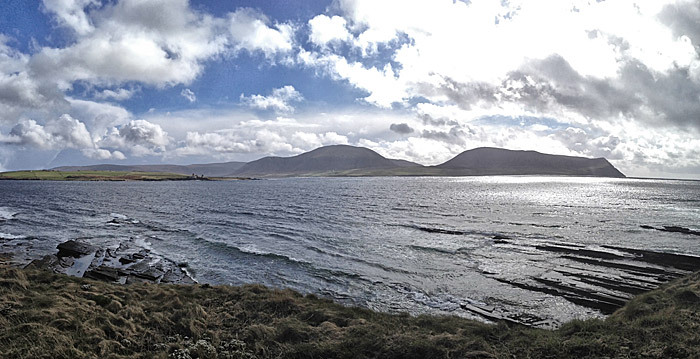 It is, therefore, not really a surprise that I think yesterday was the first day ever that I didn’t look out toward Hoy — I was too busy looking down! Hoy — just for Jay!